If you follow me on Facebook, earlier this week I shared the proposed design for our upcoming Quilt-Along, Aiming for Accuracy. I am really pleased with the wonderful comments. I thought I’d share the various design drafts, so you could see how it progressed. 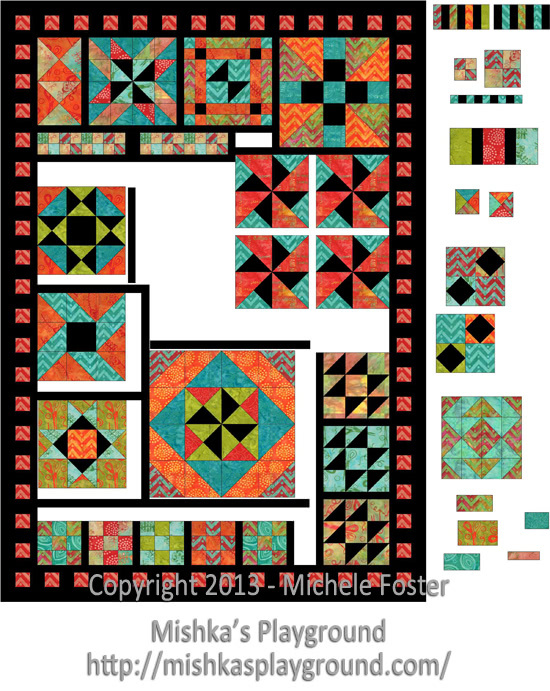 I used Electric Quilt 7 in a custom quilt setting to create the designs. I struggle with this program, as I don’t find it very intuitive. However, that said, their documentation is fantastic and once I get out the book, read up on what I’m trying to do, it’s smooth sailing. The first draft … oh my did I struggle to get this done (read the book!!). Ok, this version eliminated all partial seams. Someone asked on Facebook what the finished quilt size would be, and I realized that somewhere along the way, I had changed the layout size in EQ7 to a size that wasn’t quite as big as I wanted the finished size to be. Plus, I wasn’t thrilled with the black distribution as I wanted it more uniform. And finally, the completed design. Finished quilt size is 58″x82″, a very nice lap size. I went to the printers yesterday and had them print me out one copy in colour and several in black and white. Now I need to cut it up and plan the various lessons. I know you’re going to ask … when will the quilt-along start? Best I can tell you right now is SOON. I want to get the lessons planned out first, figure out the math, and make sure everything will fit together as designed. I’m hoping to have the planning done within the next week, then I can let you know the fabric requirements and we’ll get started a couple of weeks later. The quilt-along will be free for all to participate in. However, the lessons/tutorials will only remain on the site for a month after the QAL finishes, then they’ll be turned into a booklet for sale. You can sign up for my newsletter or follow on Facebook to keep in touch. What do you think? Are you going to participate in the quilt-along? It looks wonderful. I love playing in EQ and the more I use it the easier it is to remember how to do things. I don’t use custom layout much though. Too bad you don’t live closer you could come to our EQ WE DO group. Yes, I plan to participate in the quilt along. I’ve never done one and thought I should try it. Thanks for offering it for free. Great design. Long quilt! 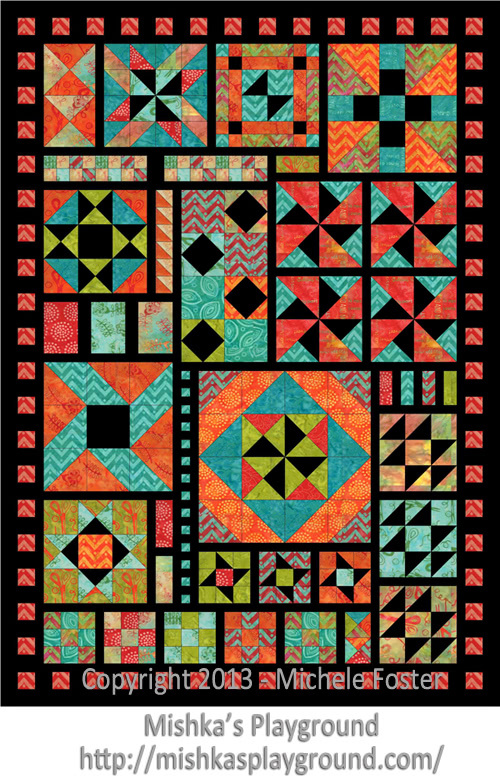 I am loving this quilt and I am looking for a fun new project. Count me in! Mich, that looks awesome, you’ve put quite some effort and time in it. You know I always work on lots of projects at the same time and this one will be amongst them too, I’m in. Cuddle for Milo from Anita. I actually like the one that comes out smaller (and you don’t like the black distribution.) Something about it appeals to me more. It is probably that it is a bit Quirky! and I like Quirky. Michele, I love the design sooo much (although the first one is my favourite.) I will be looking forward to the quilt along impatiently. gosh, I love them all. Bright colors and black always appeals to me. Count me in too! Love them all. I will be following your emails. Also love the colors. Great job. I also struggle with EQ but keep on trying. Sooner or later I’ll get better. Do I need to have access to EQ (because I don’t)? If I can do it without EQ then plz count me in. This will be my first QAL and I’m excited about it! Love all the designs Michele!!! Awesome! I love your design and may give this a try. Thanks for all your hard work. I don’t even know what EQ is, though I have made several quilts. I love, love, love this quilt. I am anxious to get started. The color distribution is beautiful and the variation of blocks are exactly what I love to do. Go samplers! I think it is wonderful and that I need to take a look at my stash. Perhaps I need some chevron fabric. Right now, Marshall Dry Goods have Chevrons at a good price. Great job. Looks like you’ve covered all the basics and then moved on a bit from there. Should be doable by most. I’ve used the custom set a few times, but have just upgraded to EQ7 so have to relearn. Looking good, I hope to participate. Love the black background. Look forward to taking part in this quilt along, well done and thank you. Just what I was looking for! I want to make a long lap quilt for my oldest nephew’s 25th birthday (he’s really tall) – hopefully I can get this one done on time! Thank you so much for your wonderful website, and for all the work you do for us! I will definitely quilt along with this one. I am looking forward to working on this quilt. Thank you for all your hard work. I love it! I’ve been wanting to do an entire quilt in batiks and this might be the one! Looks awesome, but I kept going back and looking at the others, they are all great! I even like the colors, which aren’t somethng I would have selected. Great job!! This is the first quilt along that has inspired me. I probably won’t keep up, but will print out instructions and catch up as I can. Choosing fabric is going to be interesting. What a great design. 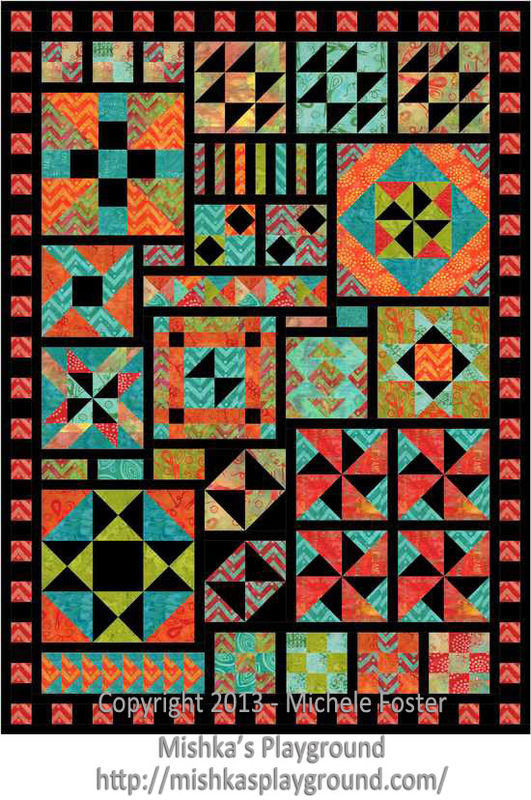 I like the design and the colours I would be interested in doing this quilt absolutely! I would love to participate, love the colours. It was very interesting to watch the metamorphosis. Love this ! Loved the previous QAL, will love this one too. Been looking for a dark pattern with bright colors! This looks wonderful. Really want to participate in this quilt along. Love how this pops with all the bright color against the black! What line are you using for this? Not sure if I can participate,super busy at the moment,but will squeeze it in if possible! I love the designs and the colors you have used. I want to join in the fun. Just hope I can keep up with you. Love the design. I hope to join in the fun. I struggle with EQ as well and for that reason, I’m still trying to work with version 5. Couldn’t justify more upgrades! 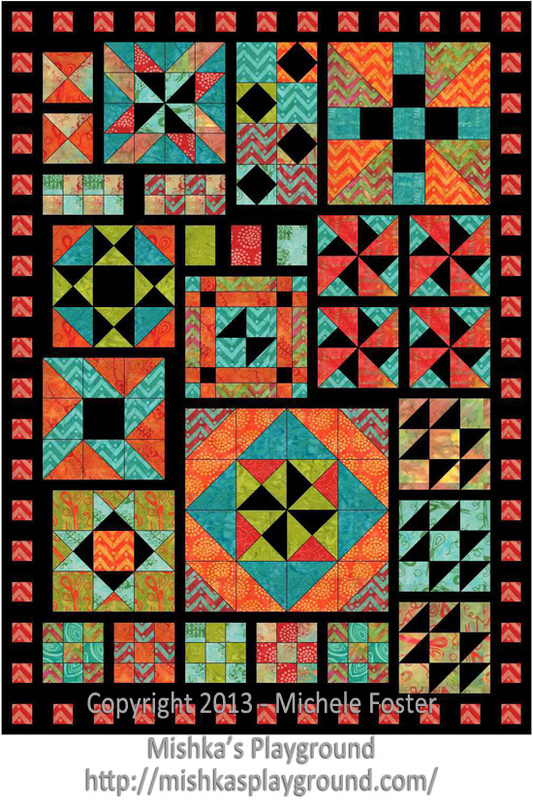 I would love to make this quilt, the blocks look easy. I love the not tooooo hard blocks. Any way you lay it, it is nice. I love design 1 and 4. This is a great quilt. Can’t wait until it starts. I love your design and yes I am hoping to participate. It looks like a very fun quilt to make. This looks really lovely and I love the emphasis on precision! I teach beginning quilting and I will definitely be encouraging my students to follow along. Awesome, I love the colors. Definitely interested, love the quilt. The quilt that you have designed is gorgeous! 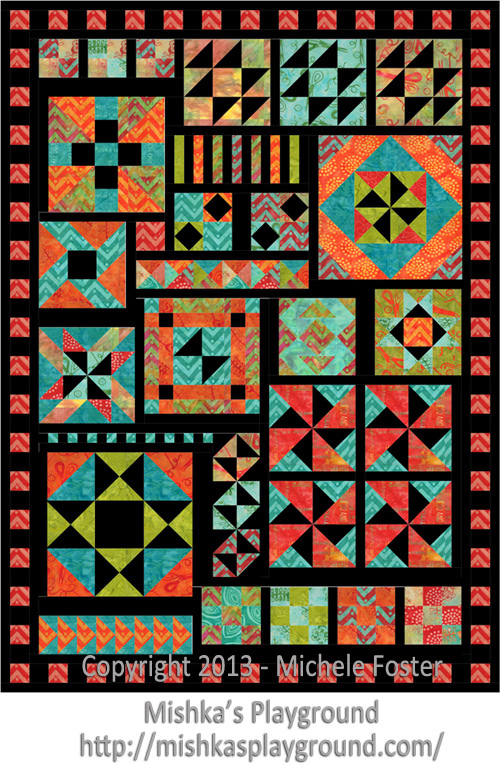 I am excited about the prospect of being able to work on this quilt & fine tune my points:) Can hardly wait to begin! Thanks for the opportunity! !